I know most people are back-to-school or at least back-to-teacher-work-week (GOOD LUCK). If you’re not quite back yet, or you’re in the middle of first-day-over-prep syndrome, here’s some fuel for your lesson-idea fire. I’m going to talk you through my favorite First Day stations. I am a HUGE fan of using stations in class throughout the year. There are so many opportunities to work in reading, listening, speaking, writing, culture, and it gives those antsy teenagers a chance to get up and move as soon as their attention span on a given task starts to wane. The stations below are all about ten-to-fifteen-minute activities that you could use as stations or as a brainbreak/closing activity throughout the first couple of weeks of class to build classroom environment. Last year was my first year I jumped immediately into stations on the first day of class. I had taught an overwhelming majority of my students the year before, so I felt brave, and wanted to do something a liiiiittle different with my kids besides your standard get-to-know-each-other/read-the-syllabus kind of day. The stations worked well in classes where I already knew all the kids and our environment was pretty well-established AND in classes where everyone was new to me and new to Spanish. I would definitely recommend giving them a try. First, a word about how I do stations. In my classroom, I have assigned seats at tables, so it’s relatively easy to put kids into station groups based on where they sit. On the first day of school, people are mostly still figuring each other out, so you don’t have to stress too much about grouping people perfectly. I had 90 minute blocks, which meant with 5-10 minutes of warm-up and 5-10 minutes of clean-up and conclusion, so about five or six stations of ten to twelve minutes each was ideal. At the end of each ten to twelve minute time block, I’d play some popular Latin music (last year it was Soy Yo) to cue that it was time to rotate to the next activity. The key with stations is to make sure each activity is SUUUUPER easy to figure out without much teacher guidance. Nothing is worse than spending five minutes explaining an activity to one group while another group is waiting for you to get over to them and keep them on task. Usually it works best when you can just wind them up and set them loose. That’s why having written directions at each station is key. For the first day of school, my goals were always that students would understand their ownership in the classroom and its environment, that they would be held accountable for their behavior and work in class, and that they would be supported on the intimidating mistake-filled journey of language learning. Proficiency, setting language goals, and the importance of studying Spanish were saved for the second day of class. So my first day of school stations dealt a lot with the social-emotional sides of language learning and with the decorations I had in the room, so that students started the year off associating meaning with what was in front of them on the walls and buying in to the classroom environment. At station one, I gave them a worksheet that listed a lot of the words and phrases posted around the room, and asked them to work with the people in their group to write down as many meanings in English as they could guess or remember. Each of these words and phrases (question words, which you can find here, and classroom expressions, which you can steal here) is written in Spanish with a picture next to it, so even students with zero Spanish experience could potentially try to make a guess at meaning. I like that they have the support of their new classmates for this activity as well. I also gave them the freedom to get up and look closer at each picture if they wanted to (movement in middle school is a good thing). At station two, I gave them the answers to station one (except for the kids who started at this station, obviously), and gave them their syllabus. Their task at this station was to read through the syllabus and write down three or more questions about the class, me, or learning Spanish. This task usually doesn’t take a full ten minutes, so I’d also give out their student surveys at this station, which I usually give as homework on the first day of class (yes, I’m evil, but whatever kids like talking about themselves). At station three, students would sit down and chat with me. This was my FAVORITE. They’d arrive at the conversation station with questions they’d prepared in the syllabus station, and after that conversation ran dry, I got a chance to get to know kids and chat with them about their summers. Student relationships are the best, so this was a fun one for me last year. If something comes up at a different station that you have to tend to, the kids also can work on their survey homework while they wait for you to bounce back to them, which is also a good deal. Station four was supposed to be a “silent” station, but I had a hard time enforcing this from where I was sitting at station three. At station four, I had written down the six activities from our syllabus that are essential to learning Spanish. I stole some of these from La Maestra Loca last year and tried out a version of her “chalk talk” idea for this station. I cut out titles of the activities and glued them to butcher paper on the wall. I asked students to write or draw pictures about what each activity meant to them close to each title. I left these up for the first couple of weeks as a reminder too. I directed students to my handy dandy Meme wall for station number five. Basically I had them read through the Memes and write down the meanings for as many as they could. This was a great activity in Spanish 1B and Spanish 2, but resulted in some blank stares in Spanish 1. I didn’t quite have enough scaffolding about cognates before this activity for my Spanish 1s, which made this my weakest station for them. You could do a similar activity with whatever posters or cultural materials you have in your room for upper levels. Station six directed the kids to a series of maps. The goal of this activity was to get them immersed in culture and get them thinking about the concept that language is different everywhere. I listed a few countries, then had them fill in what continent each country is on, what the capital is, and how you say “cool” in that country. 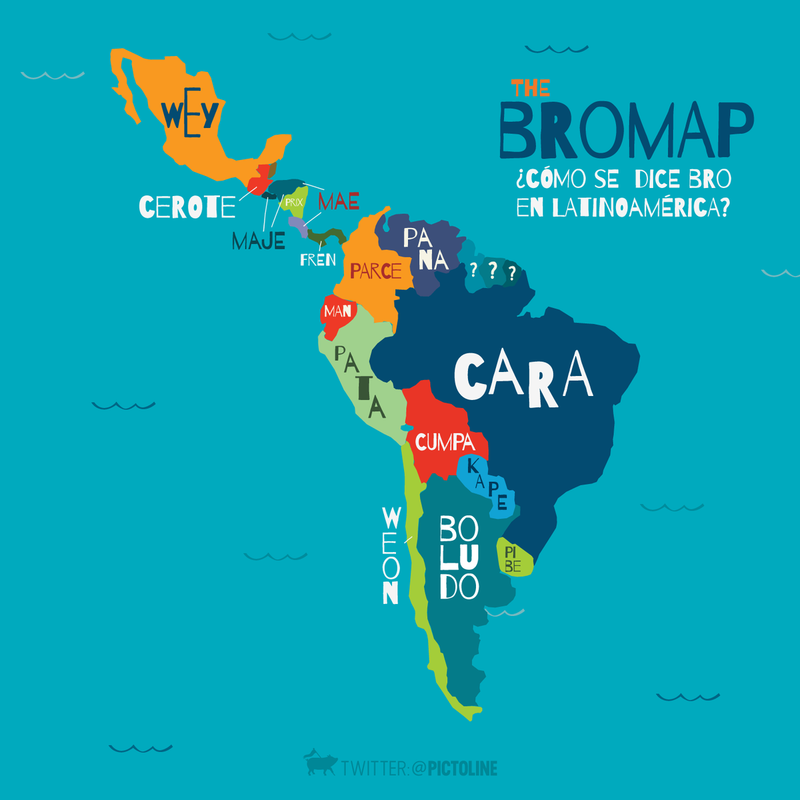 I thought about using this bro map as well, but the language on there is pretty strong for middle school. Overall, I loved this station as a review/introduction to the variety in the Spanish-speaking world. I know a moment ago I said five or six stations were ideal, but I also used a seventh station in a couple of my classes, or as a conclusion activity depending on time and the number of kids in the class. The last station was to come up with a class “silent signal” to use in our class when we transition from group activity to silent activities. Each group would propose a signal and then the class would vote on their favorite. They’ve used the silent awkward turtle, the silent llama, and a “live long and prosper” butterfly in previous classes (middle school is the best), but some classes like making up clap rhythms too. It’s a fun team-building exercise that you can use or change as the year continues. I just love giving them that extra additional ownership in the classroom routines. Whew! These are a lot of different activities for the first day of class, but I hope you can steal something fun. I love group work like this to start the year and build some strong community from Day One, since it’s so necessary to that risky, brave process of language-learning. Let me know if you use anything! Good luck with your first week! For more in the First Day Prep Series, check out my intro post, free decoration ideas, and infographic syllabus. Thanks for the comment April! For my level one classes, I give written instructions in English at each station, but introduce them in the TL at the beginning of class orally. It also depends on if you’re working with a 45 minute block or a 90 minute block. I had 90 minutes so I had time to act out the instructions at the beginning. Hope that helps! Occasionally I’ll link to Amazon products on my site that I think are useful and functional in the language classroom. If you buy those products, I could get fees in return (thanks!). Because of that, I have to tell you that “I am a participant in the Amazon Services LLC Associates Program, an affiliate advertising program designed to provide a means for me to earn fees by linking to Amazon.com and affiliated sites.” Yay waivers!